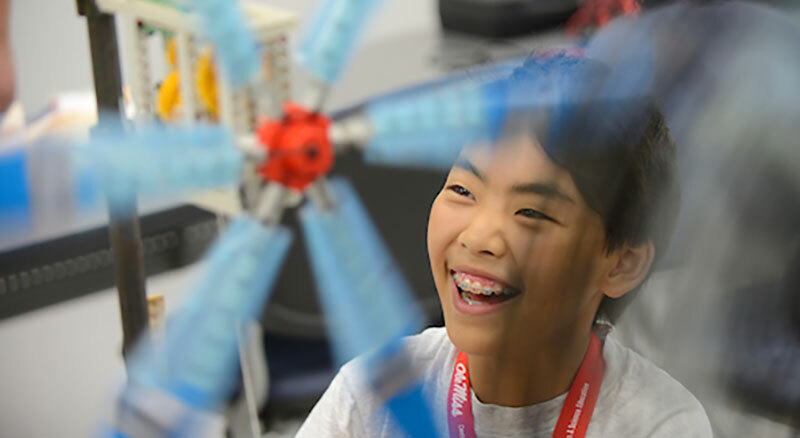 Photo: Last summer, middle school students had the chance to design, build, and test their own windmills during one of the engineering camps offered by the University of Mississippi Office of Pre-College Programs. This summer, there are several new offerings to help students explore future career possibilities and more. A special open house event will be offered on Tuesday, February 12 at UM's Jackson Avenue Center between 4-6 p.m. Families can stop by for hands on demos and activities designed to give a preview of the over 40 different programs available for rising 1st - 12th graders on the Oxford campus during Summer 2019. OXFORD, Miss. – It's inevitable. Kids are going to be spending a lot of time playing video games this summer. Instructors from the University of Mississippi want to show them how to do this safely and perhaps even professionally through the brand new "Esports Business Workshop," coming up June 24-28 for rising ninth-to-12th-graders. This is just one of more than 40 program options available this summer for students from kindergarten to 12th grade through the university's Division of Outreach and Continuing Education. Families can explore all their options during a special open house, set for Tuesday (Feb. 12) at the university's Jackson Avenue Center. The come-and-go event is slated for 4-6 p.m. and features hands-on demos and activities with program instructors as well as information for parents concerning costs, payment options, scholarships, safety and supervision. "We get requests from students for a wide variety of themes because they're curious about all kinds of things and want to learn more in a way that goes beyond books or the internet," said Wendy Pfrenger, UM pre-college programs director. "We also get a lot of students who have a good time each summer and return year after year, so we're always looking for new things to excite them." Several of this year's new programs were developed because of recommendations from past summer program participants and local students, Pfrenger said. "This year's 'STEAMpunk,' 'Mostly Medieval,' esports and Mississippi Blues programs are ones you won't find anywhere else, and they came about because of things we've heard from kids," she said. "We also heard from local families that they'd like an affordable option for middle school students wanting to attend multiple weeks of day camp, so we developed 'Makers and Mechanisms' as a response to that." Students who like to design and build things can choose to attend one, two or all three weeks of the new "Makers and Mechanisms" program, designed for rising sixth-to-eighth-graders. Beginning the week of June 17, the first week of the program, "Sculptures and Dioramas" guides students to create sculptural scenes from movies and stories while designing characters and getting creative. "Grandpa's Garage" week begins June 24 and allows students to dismantle household appliances to see what's inside. The group will build simple machines and more in this project-based workshop. The third week of the program, "Chain Reaction," will explore causes and effects in this science-and-engineering-themed week. Students interested in Victorian mechanical innovation, exploring the natural world, and experiencing the literature and history of the period can join Ole Miss faculty June 24-28 for the all-new program "STEAMPunk: The Human/Machine Equation," for rising ninth-to-12th-graders. "STEAM" refers to science, technology, engineering, art and mathematics. Participants will look at how science fiction, film history, literature, Victorian-era history, natural history and philosophy during this period changed the world and made its way into fiction, art and technological innovation. Scotty Jimenz, a teacher at Lafayette High School, will lead the all-new "Mostly Medieval" program June 3-7 for rising sixth-to-eighth-graders. "Students who want to shoot a catapult, try LARPing (live-action role playing) in the Grove and see what it was like to be a knight in King Arthur's round table, this camp is for you," Jimenz said. Students will explore with UM faculty who specialize in the history, literature, culture and archeology of the period. Music lovers can examine more about the personalities and historical events that shaped the culture of Mississippi's most famous musical genre during "Back to Our Roots: The Mississippi Blues Tradition." The program, taking place July 15-19, will be held in Oxford with field trips to significant sites throughout north Mississippi. Even non-musicians will have opportunities to create blues music in this program for rising ninth-to-12th-graders. The first-ever Rebel Rx Pharmacy Camp, for rising ninth-to-12th-graders, is slated for June 3-7. "There are so many different ways to have a career in pharmacy, so many settings students have never even considered: community, hospital, clinical, research labs, industrial and consulting, to name a few," Pfrenger said. "Rebel Camp will expose them to those settings, so I think it's a great way for students to make connections between the world of work and what they're learning in school." All the one-week programs are offered with residential and commuter options to accommodate those who want to stay on campus and those who would rather go home each night. These are just a few of the one-week programs available to middle and high school students this summer that are designed to open their eyes to a variety of activities, majors and careers. Other popular offerings include engineering programs, creative writing, Rebel Chefs, ACT prep and leadership workshops. Information on the local favorite, UM Rebel Quest program for rising first-to-sixth-graders also will be available at the open house. This weekly day camp program allows families to mix and match weeks that work for their summer plans while giving students a fun, learning experience. Some of the Rebel Quest Summer 2019 weeklong themes include "Time Travelers, "Mad Scientist" and "Under the Sea." With the variety of options for summer programming, the pre-college programs office works to help families secure scholarships and other opportunities to be sure students who want to participate are able to do so. "I think summer camps are an important part of the journey for kids as they grow up," Jimenz said. "Students get to establish new relationships with people from all different backgrounds and make special bonds with fellow campers, all while learning skills they can use for college preparation and for life." To view all the K-12 summer 2019 academic program options available through the UM Pre-College Programs office, visit http://www.outreach.olemiss.edu/k12summer or call 662-915-7621.